I have been searching the forum for a conclusive description of miRNA serum extraction, but I haven't found anything beyond references to "Trizol extraction, the usual, you know". I have already tried 2 kits (Ambion miRVana, Qiagen miRNeasy) and for the Qiagen kit I have tried some extra wash steps and also precipitation. I have however never reached sufficient RNA quantities, even when starting with 1ml of serum. 0) What kit / reagents do you use for totalRNA extraction from serum and what modifications do you apply to the manufacturer's protocol? 1) I tried precipitation with glycogen during extraction, but I never saw anything close to a pellet! Since the original kit instructions (Qiagen, miRNeasy) don't include a precipitation step, I went ahead and proceeded with the entire volume and added it to the column. What effects do you expect when not getting the pellet and therefore not washing it? What could be the reason for my missing pellett? 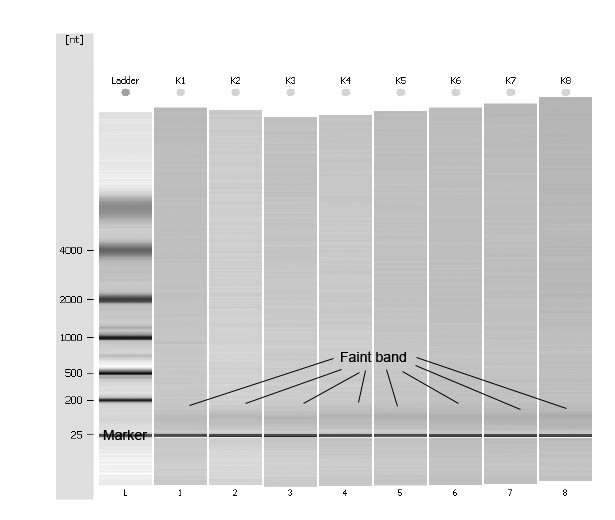 2) Has anyone ever used serum samples for miRNA microarray? 4) How much serum do YOU need to produce 1µg of totalRNA? Thanks for your help and insight, I know that there are partial answers to these questions in the forum and I have read these, but I'd be grateful if a number of people posted their collective experience here so we can get a general picture. I added a nanodrop bioanalyzer pic of my serum samples. There is a faint band in the miRNA region. These samples were analyzed by microarray. 8 samples in total, derived from 2 biological samples. So in all, we have 2x 4 replicates, but they totally failed to cluster appropriately. Thanks a lot & cheers! I don't understand, why do you say Nanodrop is not reliable for RNA? Because of RNase Inhibitor? try measuring before adding such components. last time I used a kit for mRNA extraction from Roche Applied Science, but it also needed DYNAL magnet racks because the extraction principle relied on magnetic beads. But for miRNA I'm not sure. I use Qiagen Mini easy for total RNA. it has a red box. Trizol is also good, but I only use Trizol if my sample has a small volume such as virus samples. But for Eukaryotic samples I use Qiagen kit. - I readily admit that I can't give you facts why nanodrop is supposed to not be suitable, its a comment I've come across talking to several people and that I've seen here in the forum, too. Can someone clarify (or correct my feelings about the nanodrop)? - Don't the Qiagen Mini Kits lose the miRNA fraction? I believe you need the miRNeasy Kits. In any case, it sounds like you are extracting RNA from tissue, not serum? I'm specifically troubled by serum, tissue is working fine so far. They have kits for everything, after all they have the widest range of kits in this business. I use Nanodrop myself. I have no problem with it. +1 for the Nanodrop. No problems unless your concentration is really low (<10 ng or so). For the isolation: Chen et al Cell Research 2008 18:997. Equal vol of Trizol to serum, and 3x P/C extractions, to get 5-10ug RNA from 50 ml serum. Also check out Mitchell PNAS 2008 105(30):10513. They used an Ambion kit, but I don't currently have access to the supplementary information where the methods are contained. I am working on circulating miRNA as well. there are two schools for excreted miRNA isolation and prior to the trizol or any kit isolation. Some teams first isolate the exosomes, which is long but you re sure you don t have any contamination ! the other one is direct isolation from serum/culture supernatant. I am going to do a comparision btw those two. I ll know more next week ! Concerning which kit you should use, the guys from the functional genomic unit in my lab (who do the arrays) told me that Trizol/tri-reagent was mor suitable because you may loose miRNA with the columns, they don t retain all miRNA. that s why they recommand to use trizol with glycogen. I have very similar problems. After extraction of RNA from plasma (Ambion miRVana kit) I usually got about 10-40 ng/mkl according to Nanodrop, but the 260/280 ratio is always about 1.4 which is not normal for RNA, and 260/230 is awful 0.2-0.4. 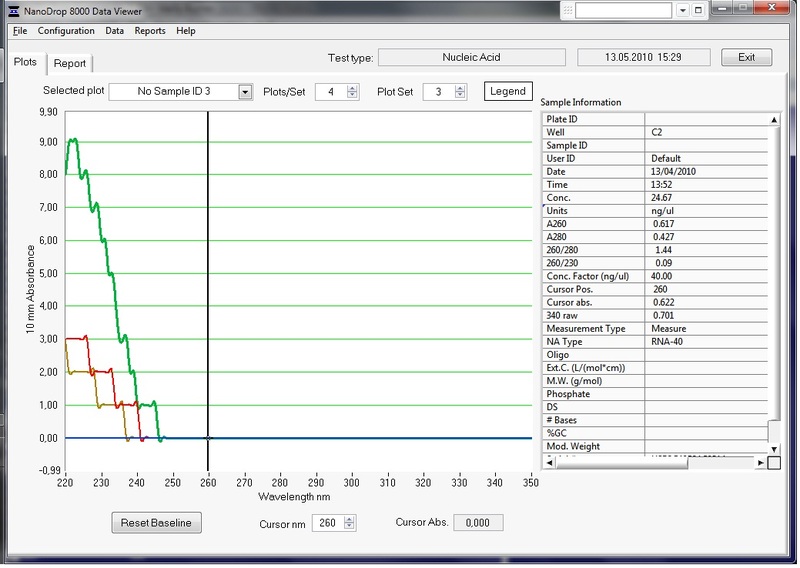 Upon running on Agilent Bioanalyzer, it seems that there is no RNA in these samples. I contacted people who work routinely with miRNA from plasma and they told that they also have abnormal 260/230 ratios after columns, and that one cannot use Nanodrop readings for RNA quantitation for these cases. Just to be up front, I should mention that I work for NanoDrop. Look at the 260/230 ratio - this will usually be poor. Look at the trough in the spectra - this should be at 230 nm. If it is at a higher wavelength (e.g. more than 235 nm) then you have some contaminant (not necessarily phenol). Look at the peak in the spectra - this should be at 260 nm. A peak at 270 nm or thereabouts is fairly characteristic of phenol contamination. Once you have used the spectra to discover that you have a problem, consider both your starting material and your extraction method. If you get unusual spectra or have questions about contaminant detection, please call or email us (number and address are on the NanoDrop website) - our tech team has a ton of experience with this and can look at your NanoDrop data and help. well, Limey, just to mention - on the "Contact Technical Support" page there is no way to attach data, and no email address (the only address displayed is on common "Contact Us" page). in my case, spectra look really quite strange (see attached). First, they are kind of serrated; second - there is nothing for wavelengths after 250 nm, although A260 number is not zero. You can email info@nanodrop.com and attach your file, or you can use the form in the "Contact Technical Support" (you can't attach data, but someone will get back to you and tell you what address to send it to). Your spectra does look terrible, but I am pretty sure that our tech support team will be able to help you. ah, I just thought that you are one of tech specialists and can comment the spectra by yourself. Ok, I've sent to them - hope to have any help. Man truth is your spectra are really mad ! About the precipitate, it's probably contaminents from plasma, like lipid or so. After freezing it may precipitate, I guess. for the last step, the elution, try to apply 2 times 50µL. You should have a better recovery. I am going to run microarray, we'll see ! why do companies like Qiagen post on their FAQ that Nanodrop is not suitable for miRNA concentration measurememnt if it is not the case: https://www.qiagen.c...9999f13&lang=en ? did anyone reach an answer to this? or an alternative? There is no problem for me to use Nanodrop to measurement RNA. But I did not find an item in Nanodrop to analysis miRNA. It is possible the concentration of your RNA sample is too low, then the 260/280 ratio could goes down, too. For me, I use Trizol, if my RNA sample concentration lower than 80ng, 260/280 ratio could be about 1.6. So, I think the first thing to solve the problem is consider how to improve the concentration of your sample.